1. I love the trapezoid windows in our house because I can cloud watch from the couch. It's relaxing. Sometimes, I can even catch the moon as it starts to rise. 2. Hey readers, I guess you've been mooned now! 3. If you like gothic, old Victorian New England house reads, check out The Night Strangers by Chris Bohjalian. It'll make you shiver. And you won't be able to put it down. And then you'll be up at night, all creeped out and unable to sleep. 4. We're thinking about getting guineas in May. Anyone have any guinea advice? This would be new for us. 5. I miss having chickens. The few that we had left were taken out by a raccoon or possum this winter. Do you think we should get more chickens, or try our hands at guineas for a change? This post linked with the fabulous Nancy at A Rural Journal. I've never been mooned before lol ! Have a great Friday and weekend Lisa !!! What a wonderful view from the window! I hope I get traffic too. My stats are down. LOL... I guess you mooned me. I have been mooned before and am sure it might happen again. That is so nice to sit on your couch and get mooned... doesn't happen to everyone. The photo is stunning--what a wonderful view to look at while relaxing! Thanks for the book recommendation. I'm always looking for something new! We had guineas and chickens at one time. Though we had problems with predators, I would love to have them again. Good luck! We have no guineas (yet) but our neighbor has them... they roam everywhere... however, if you can raise them past keet stage, they are very hardy and wise! Good tick control! I have a male guinea that you can have, I did have 4 but they have met various ends over the last few years. I got them by trading a bunch of geese as my wife gave me orders to get rid of the geese as they were pooping on the walk. Guineas are strange birds so you can try this one for free to see if you want to try them. It roosts in a tree so you don't have to shut them up at night. My number is 420nine nine one nine. Guinneas are unusual looking so that would be fun. more dark meat if you are harvesting them. Oh my GOSH!!!!! This you took from the window...I can see the window shape. Was the window open? It is clear, and just beautiful!!!! WHY have you not snapped the moon before this is glorious! As I remember, Guineas are small fowl but not chickens. Are they easier or harder to take care of, and what about the eggs?? Fill us in. Neat mix of randomness. The guineas a so fun to have around. Hunchback chickens is what my girls call them. They are, however, quite bossy with the chickens. Bully would be a better word. I love the moon photo! So neat you can see it from the couch. We have about 35 guineas right now and they are loud! So if you don't mind the noise, they'd be a good way to keep the ticks away. They are entertaining to watch so they are a fun addition to the homestead. I think you should get chickens for sure! Mine get along just fine so they could all live together. Ha Ha- I've never been mooned in blog land before! Fun post and great shot of the moon! The clouds around here have been big puffy white clouds against a deep blue sky ... awesome! The moon early this morning was a beautiful crescent. Glad someone else takes note of the neat sky. If I didn't have chickens I am sure I would miss them. I am currently overrun with eggs and need to peddle a few. I love Farm Fresh Eggs! Love that shot of the moon! I know nada about chickens or guineas so can't help you there. Have a good weekend with the guys! 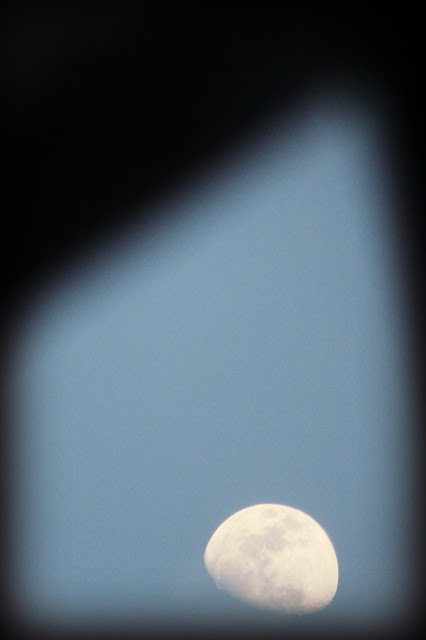 First time for everything... have now been officially blog-mooned!! Sorry, I know nothing about guineas - nor chickens for that matter (other than when grandma sent me out to gather eggs, they were scary feisty!!). Ha! I can handle that kind of mooning! I read The Night Strangers - that was with the pilot and the, uh, neighbor ladies, right? Creepy story!! Chickens, guineas -- get both! Only, don't keep them together during mating season. Or your chickens won't have any tail feathers. Oooh, cloud watching from the couch! You have a gorgeous view.! Nice view of the moon. I would get more chickens if it were me. I was just telling my hubby I wanted to get a few chicks this spring. I have missed all the fresh eggs my girls laid. The look on my hubby's face told me it was not in his plans though. I haven't had either type of pet, so I can't offer advice. They both sound fun though. Don't know a thing about chickens or guineas--we live in the city. I can tell you all about idiot neighbors though. I had 2 guineas once. I liked them but my neighbors didn't like them so much. They are very, very, very noisy! The good thing is that they are like watch dogs too and if strangers (human or animal) come near they will make a bunch of noise.